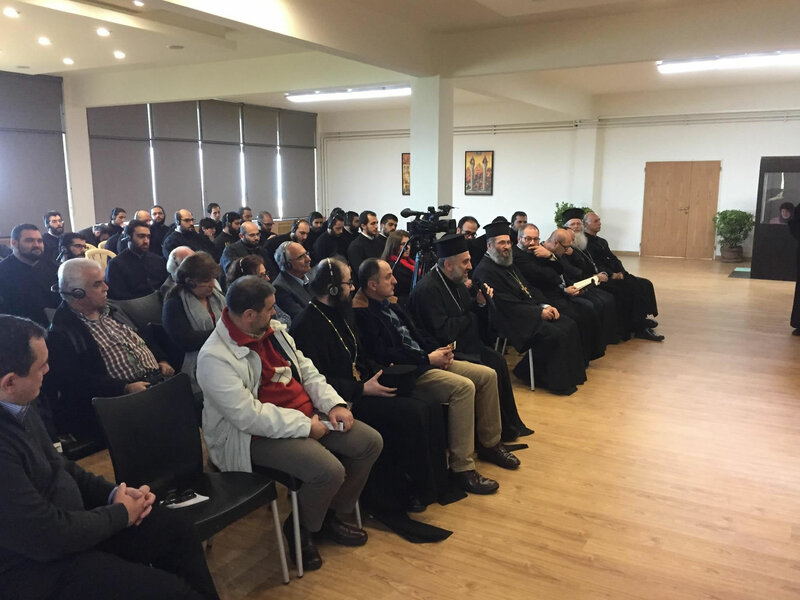 With the blessing and under the patronage of His Beatitude Patriarch John X of Antioch and All the East, the staff of Holy Trinity Publications in Jordanville, NY, participated in a week of festivities culminating in the patronal feast of the St John of Damascus Institute of Theology at the University of Balamand (Tripoli, Lebanon) from November 30-December 4, 2016. The focus of the week was the recently released scholarly work, Arab Orthodox Christian Under the Ottomans, 1516-1831 by Dr Constantin A. Panchenko of the Lomonosov Moscow State University. On Wednesday, November 30, Nicholas Chapman, director of Holy Trinity Publications, gave a lecture entitled “From Antioch to America: Levantine Christianity and the New World 1500-1800,” in which he surveyed the surprisingly vast network of connections between the Orthodox Church in its ancient homeland and the West. The next day, Dr Panchenko drew from the research in his book with a presentation titled, “A Melkite Proto-renaissance: A Forgotten Cultural Revival of the Melkites in the Late 16th Century.” Finally, the two previous speakers joined Dr Souad Slim of the University of Balamand for a seminar on Saturday morning to discuss important facets and themes of the recently-published book. The lectures and panel discussions will be broadcast on Ancient Faith Radio in the near future. 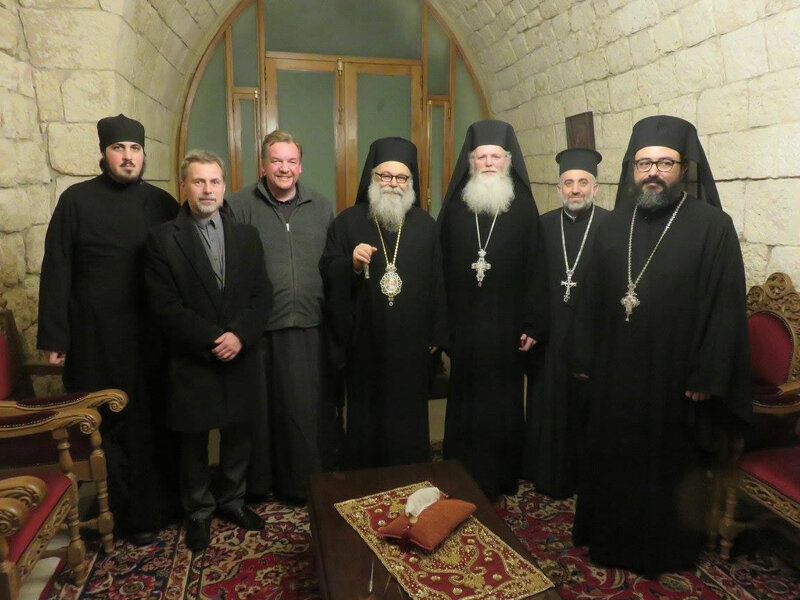 Throughout the week, the visitors toured ancient villages and cities on the Mediterranean coast and Mt Lebanon, visited early Christian monasteries, recently revived with active monastic communities, and explored archeological sites where centuries-old frescoes have recently been restored. On Saturday evening, following patriarchal vespers at the monastery church, the staff presented two of Holy Trinity Publications’ newest releases to His Beatitude Patriarch John X. They also discussed Dr Panchenko’s book, for which His Beatitude provided the foreword. On Sunday, Dcn Peter Markevich joined His Beatitude and local clergy in serving the Divine Liturgy. Holy Trinity Publications is deeply indebted to the Institute of Theology, its dean Fr Porphyrios Georgi, the staff and seminarians, for their selfless hospitality and to Dr Panchenko for joining us for the festivities. His book, Arab Orthodox Christians Under the Ottomans, 1516-1831, is available directly from the publisher or from any good bookseller. 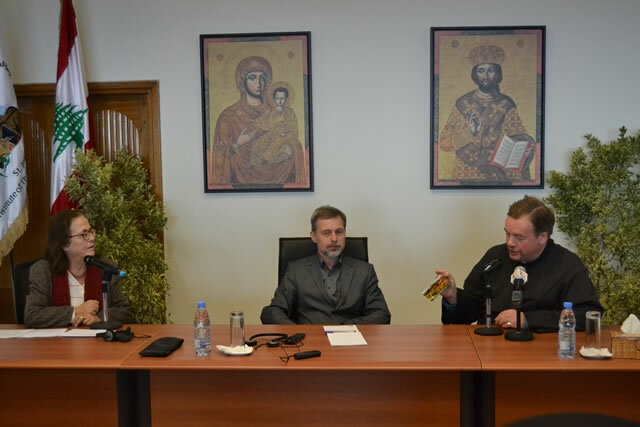 This entry was posted in News and tagged Dr Panchenko, His Beatitude, Holy Trinity Publications, Lomonosov Moscow State University, Mt Lebanon by Orthodoxy Cognate PAGE. Bookmark the permalink.